Susan Hyde is a student, teacher, widow, mother, and grandmother who has spent her life trying to figure out what she wants to do. After years of trying this and that, she stumbled into a poetry class led by a remarkable retired teacher and, after a year under his guidance, glimpsed how poetry could work or be a dud. Finally dipping pen in ink (metaphorically) after all this time, Susan has begun to decide what she thinks about the world and her way within it, exploring topics ranging from her feral cat to international politics. Poetry is now her way to put life in nutshells. 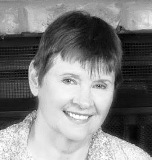 Susan, the author of A Listing Wind, lives in Dallas, Texas. Loved the bio and the poem! I could use some of those brain wipers. When you find them do send me the link Susan, please. Pretty-please!